Whole Milk, how about that? Many of us can still remember seeing our favorite pop singers with the perfect milk mustache on commercials for “Got milk?”. Later, in the school cafeteria, we would try to recreate this perfect milk mustache with milk provided by the cafeteria for lunch. Since those seemingly blissful times, much controversy has arisen surrounding milk and its supposed benefits. 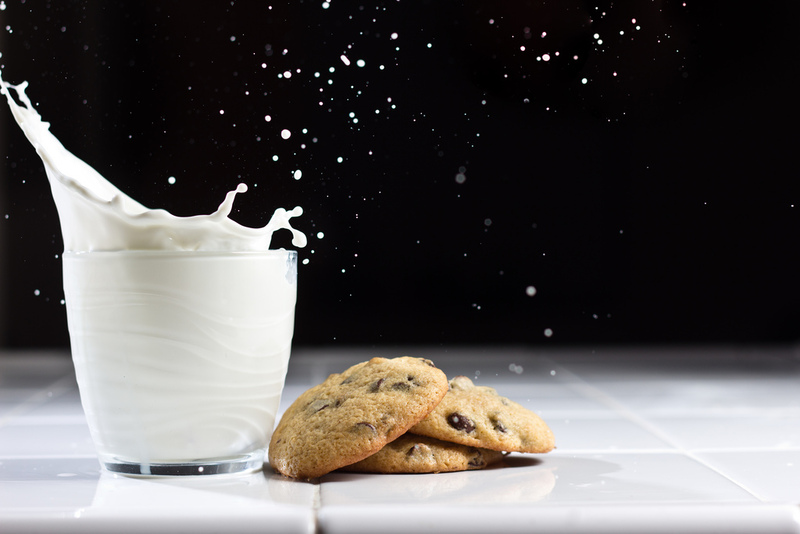 Enjoy a glass of milk and cookies! Whole milk may not be an unhealthy option after all. Milk has always been promoted as a great source of calcium and vitamin D– essential vitamins and minerals for maintaining health. However, the emphasis on these nutrients disregards the high fat, saturated fat, and lactose content of milk. To address these less desirable components of milk, the milk industry has promoted low-fat milk and fat-free milk. Furthermore, governmental nutritional guidelines, like MyPlate, also recommend three daily servings of lower fat options over whole milk. This begs the question: is reduced-fat milk healthier than whole milk? To bolster these low-fat and fat-free options, the sugar industry has biased the answer to this question by promoting research that minimizes the hazards of sugar, and casts fats as the dietary enemy. These influences have contributed to a negative public perception of fats, ideal for promoting reduced-fat milk—reduced-fat milk still has the beneficial nutrients, but no longer with dietary enemy number one: fat. In 2013, a provocative scientific review, questioned whether the three daily servings of reduced-fat milk was an evidence-based recommendation. Turns out there is a lack evidence to support replacing whole milk with reduced-fat milk based on weight management or cardiovascular disease prevention. Rather, the authors suggest, that consumption of reduced-fat milk might cause harm if sugar or simple carbohydrates are substituted for the fat. The suggestion to replace whole milk with reduced-fat milk relies on the presupposition that consumption of reduced-fat milk will lead to a total reduction in caloric intake. However, reduced-fat foods tend to be less satiating which may lead to additional caloric consumption. For example, because a snack that includes reduced-fat milk may be less filling than a snack with whole milk, a child eating the reduced-fat snack might compensate for the reduced feeling of satiety by eating more. If these compensatory calories are more than the difference in calories between reduced-fat and whole milk or if they come in the form of refined starches and sugars, the net result of consumption of reduced-fat milk may be increased calorie consumption and increased risk for cardiovascular disease. A low-fat diet, rich in low-fat dairy products, may not only increase hunger but also negatively impact weight loss and cardiovascular health when compared to a higher fat diet. When considering the benefits of whole milk versus its reduced-fat counterparts, I consider how milk consumption fits into my entire diet. You cannot assess food items as singular entities since they are a part of whole diet; it is important to approach dietary recommendations holistically. This makes generalized nutrition recommendations incredibly difficult to make and easily influenced by entities with vested interests in having their products promoted over others. So, maybe let’s enjoy whole milk in moderation, how about that?